The ACT Government will build three new nature play spaces in Phillip, Civic and Farrer. File Photo. The ACT Government is set to spend $1.9m to build three new nature play spaces and upgrade 24 playgrounds across the nation’s capital, with a community-led forum deciding how it will be spent as part of the Better Suburbs consultation program. The decision on how to spend the $1.9 million of Government-allocated money was placed in the hands of a community-led Play Spaces Forum, with parents and carers of children in the Canberra community voicing their hopes for new and improved playgrounds in their suburbs. 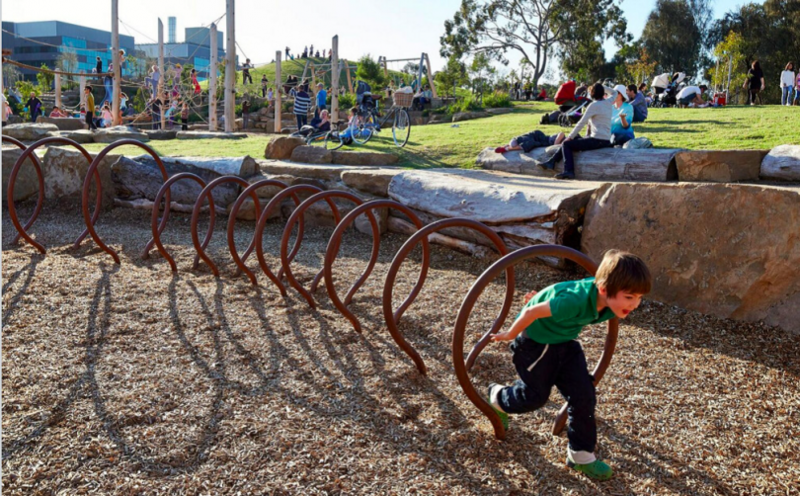 The Forum reviewed detailed information about all of the suburbs that included existing quality and diversity of play spaces in the suburb, ages catered for play in the suburb and whether school playgrounds in the suburbs were open to the public. As a result of the Forum’s recommendations, Minister for City Services Chris Steel said three new nature play spaces will be built at Eddison Park in Phillip, Glebe Park in the heart of the city and near the local shops in the south Canberra suburb of Farrer. “We know that Canberra families love their local playgrounds, and the ACT Government is committed to investing more to upgrade playgrounds right across the city,” Mr Steel said. “The Forum particularly wanted to support new nature play spaces in two of our growing town centres to enhance Eddison Park in Woden and Glebe Park in the City as a destination for children and their families. Mr Steel said the natural play spaces will provide unstructured play experiences that can be creative and imaginative, using primary elements from the landscape, such as logs and rocks, to encourage children to climb, jump, explore and develop their coordination skills. 24 suburbs across Canberra will also receive upgrades to existing parks and playgrounds such as shade sails, new benches and tables, upgraded footpaths, and fences to be installed at eight playgrounds. Mr Steel said that the Government supported the Play Space’s Forum’s call for a more strategic approach to playground upgrades in the ACT and will conduct suburb play space reviews in Richardson, Waramanga, Torrens, Narrabundah and Higgins. “The suburb play space reviews will be an important opportunity to work closely with established communities, to look at all of the existing play spaces in each suburb and how better quality play spaces can be provided that meet the needs of local children and families,” he said. The important take away message for me anyway is they’re recognising that play space is a real need and addressing that by investing resources (people will always quibble about how much and where and is it good value). Of course, we’d all love them to upgrade our own local (which has been stripped to the bone and left to decay despite being the only playground servicing a rapidly growing inner north suburb that’s regenerating and pulling in lots of families with little kids). The key thing to keep in mind here is that social infrastructure is a long term investment and is going to go through life cycles as populations wax and wane, so planning for community uses, clubs, arts and cultural experiences, recreation and play must keep up with population and demographic forecasts and be informed by what community service providers say is needed. There will inevitably be lags in delivery and patchy roll out, but if there’s no strategic plan we’re just flying blind. Completely fails to mention that there will be accessibility upgrades to make more local playspaces appropriate for disabled children and adults. Thanks for writing people with disability out of existence again. Once upon a time people also lived in smaller houses allowing bigger backyards to play in. I see it where I live. Small houses, plenty of yard to play in; house knocked down and yard filled with MacMansion, which is considered a normal sized house now for a family. (Although many might only have one or two people living in them.) The first house I bought was 99 sq metres, three bedrooms and I bought it from a family of five. People would 'scream' if that was suggested as a first home now. I see it happening here. My first home as a child was a flat over shops. My second home was a small two bedroomed house, which allowed plenty of space for a small child to play, because the house was small; not what people build now. Julie Macklin - totally agree. How about the ACT Government spend some money to replace the play areas they’ve taken away since coming into government. All those poor kids who are going to be raised in flats instead of houses, thanks to Labor housing policy, will need to make use of them. There is nothing wrong with flats and apartments as a property choice. Europeans have lived in them for centuries and I don’t think, on average, there kids are any better or worse off as a result. However, it does need support with appropriate public facilities. So many older suburbs with terrible facilities desperately in need of updated facilities for kids of all ages and spaces for the local community to meet and get to know each other. Can only hope the spend covers all of Canberra with the areas most in need coming first. So like are these gonna be fun or just like three metal poles in the ground with some safety rope connecting them. As always, Belconnen ignored again. Not really, Belconnen already has an awesome nature playspace, and Belco and Gungahlin between them have fabulous district playgrounds (Yerrabi Ponds, John Knight, CRIPS etc). The inner north hasn't got a district park at all, and pretty much every area was reviewed and prioritised for a reason. Also Higgins is getting a review and a bunch of other playgrounds are getting upgrades - the $1.9m isn't just going on 3 nature playgrounds. Where’s Belconnens nature play space? Yes, where is it Helen. John Knight is hardly a natural play space and besides, its 40 years old or thereabouts. Plus a new dog park for West Belconnen? A dog park is hardly a mature playground for children. West Belconnen is a very recent area and should have recently built facilities. Plus it's super removed from everything so infrastructure spend probably wouldn't get used much. On the other hand, suburbs like Waramanga and woden areas are older and desperately need some refresh. These are also the next hot spots in terms of city expanding and exploding house prices...so money best spent there. We’ll take some normal every day post 1980’s gear in Watson. We don’t need any of the $1.9M special gear you’re looking to roll out. We’d just like a few updated spaces in which kids of all ages can enjoy the equipment and the community can meet and socialise. Simple needs and very cost effective too. Not impressed. The money should have been used for building new fitness stations in suburbs which don’t have them. Kids have been pandered to enough. There are plenty of gyms around the place to be honest – I don’t see what aspect of fitness equipment truly is ‘public good’ like. Sure its great to have some fitness equipment around the place here and there, but I’d argue there isn’t a market failure there that really needs much government intervention either. What a load of rubbish – literally. These “nature” play spaces are actually cheap faux-parks for govt to dump any removed tree trunks and surplus calverts and excess tanbark, and call it a “park”. Cynically ripping-off kids. Yes, there’s noting the ACT won’t stoop to. -$250m courts precinct – no, wait, its late and overbudget… $300m??? Does anyone know what is happening regarding the park on corner of Heagney and Deamer in Chisholm. It was meant to be upgraded years ago after being saved from inappropriate development, in fact there was a design competition, but no sign so far . . .
"unstructured play experiences that can be creative and imaginative, using primary elements from the landscape, such as logs and rocks" also low maintenance cost. What a cop out, you go to a playground for play equipment, not logs and rocks. They use this to justify less play equipment in play spaces. We have a playground in Wright, *ringed by high density apartments* that features one slide and two swings. No shade, no water, no fence, no bins, a couple of benches & partially shaded seating area. The mounds qualify as "play experiences" to make up the requirement of "10? play features". Tell that to the kids lining up to use the three actual items of play equipment. Agreed. I can't help but wonder why Nature isn't good enough to prive 'Nature Play' experiences?